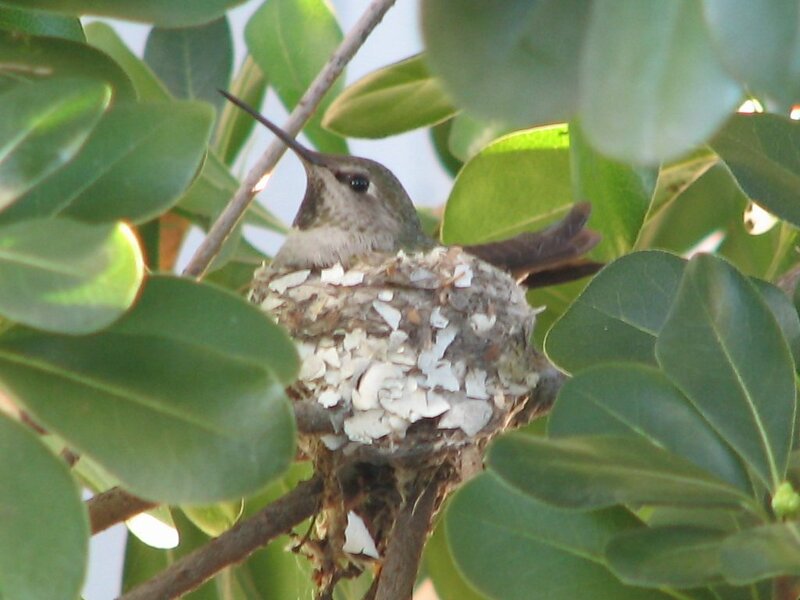 Here’s an update on the hummingbird nest in our back yard. 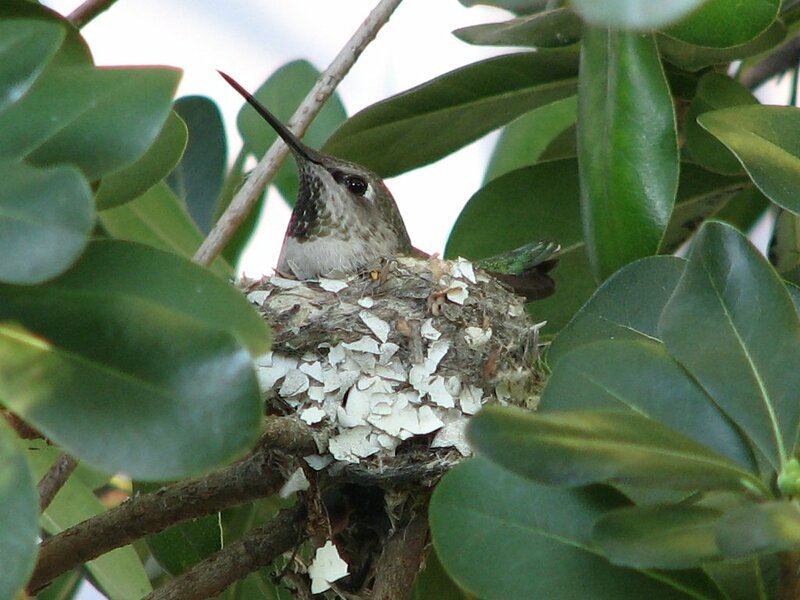 The hummingbird’s eggs have hatched. Lucinda and I took a quick peek inside the nest when she left to go feed. And there they are. They must have just hatched. This should be interesting to watch. And I hope they won’t be too bothered by having a bunch of kids in the yard tomorrow for Lucinda’s birthday party. Tonight I went to see “Varla Jean Merman Loves a Foreign Tongue” at Ultra Suede in West Hollywood. I went with my friend Nick, who is also a big fan of Ms Merman. We got there early, so we got to sit in front. We shared a table with the one non-gay couple there. I’d met them at Varla’s show last year. The show was very funny, and overall it was tremendously entertaining. And afterward, Varla held court in the back of the room, selling DVDs of her third video collection, signing autographs, and posing for pictures. Nick and I both remembered to bring our cameras this time, so we got our souvenir pictures with La Merm. 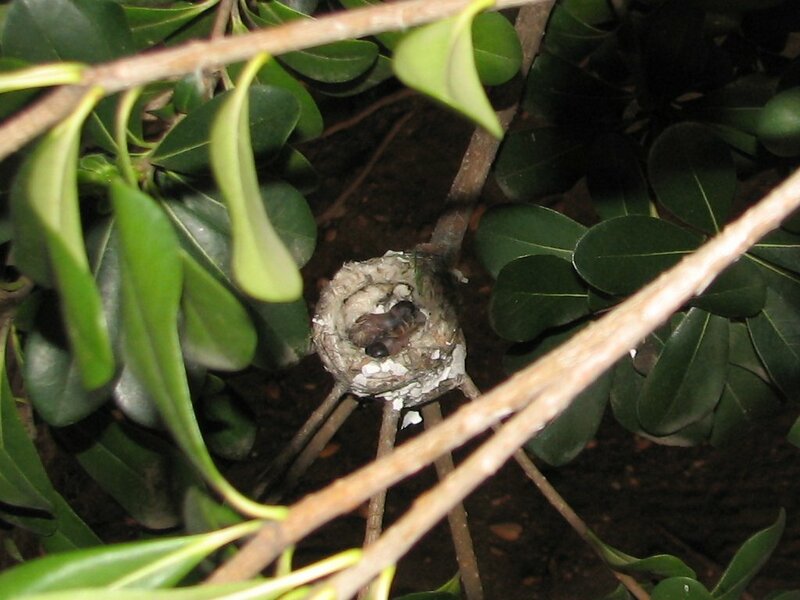 I found a hummingbird nest in the back yard. So now I have company in my nesting behavior. Edit: I added another picture when I got home from work. As usual, my camera rocks. Cooking is still one of my most favorite ways to express creativity and reduce stress. So I’ve been trying a lot of new recipes lately. Tonight I made Thai-Style Chili Beef. It was quite good. Very tasty. 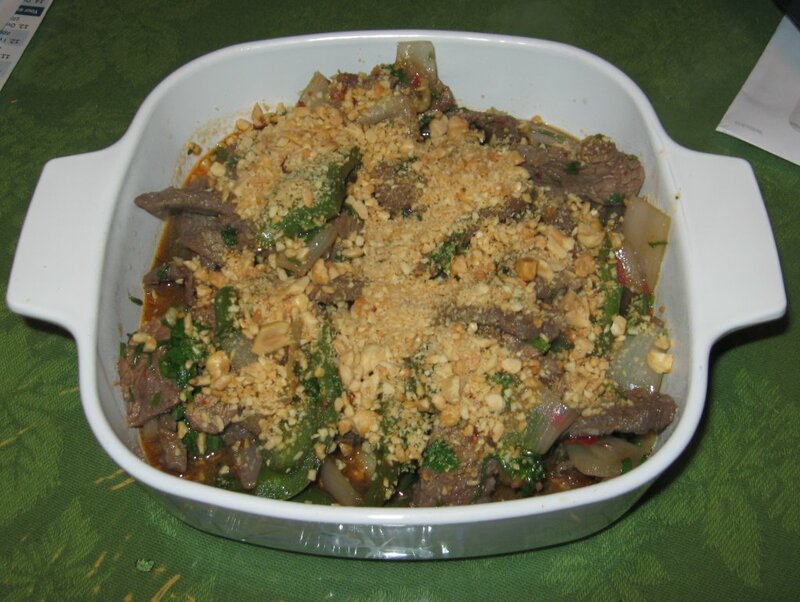 The recipe used Thai basil instead of the cilantro-mint mix that Cooks used. Since I had cilantro and mint, but no basil, I went that route. I used jalapeño peppers, which I was hoping would give it a good kick. As it turned out, they were quite mild. Next time, I’ll try serranos. Still, it was very good. Lucinda and I liked it a lot. Today’s plan was that Lucinda and I were going to go see the final stage of the Tour of California over at the Rose Bowl. But it was raining today. The race was still on, but standing outside in the rain all afternoon just didn’t seem like it would be all that much fun. So I talked to Lucinda, and we decided to go to Musink. We brought along her friend Alisha, since she’s also an “L.A. Ink” fan. I took them to visit the High Voltage Tattoo shop in Hollywood last month. We got down there at about 1:30, and it was already hopping. It was the biggest crowd I’ve ever seen on a Sunday afternoon at a tattoo convention. We stashed our jackets under the table at my friend’s booth and set off to wander around. They had a sign up at the High Voltage booth that said that Kat, Kim, and Hannah were going to be greeting fans at 5:00. We talked to the people in the booth and asked them what time we should plan on getting in line, and they said 4:00. We wandered over to the vendors’ building, and Lucinda and Alisha both got little glitter temporary tattoos. I also stopped off at the Burning Angel booth just to show Lucinda’s second-grade school ID to Joanna Angel. In her picture, Lucinda had a bright red streak in her hair, just like Joanna has now. She thought that that was very cute. Back in the tattoo building, we saw Kim at one of the booths, so we stopped to talk to her and get a picture with her and the girls. By this time, it was about 3:30, and a line was already forming to meet Kat. So we got in line. The sign had said she would be out at 5:00, but she came out earlier, since the line was so long. We all got our pictures with her, and she also signed Lucinda’s shirt that we’d bought last month when we visited the shop. After all that excitement, we went back to the vendors’ building and Lucinda bought a set of makeup brushes, and I got a print from Matt Kotch, who is an artist who does paintings of weird sea creatures. By the time we left, it was time for dinner, so we stopped off and ate before heading home. Last Monday when we were on the way home from playing in the snow, I saw a mailbox with hot-rod flames on Padua Ave in Claremont. I have a small collection of photos of mailboxes like this. Now, I could have just stopped the car and taken a picture of it then, but I thought, “where’s the fun in that?” It didn’t seem very sporting. 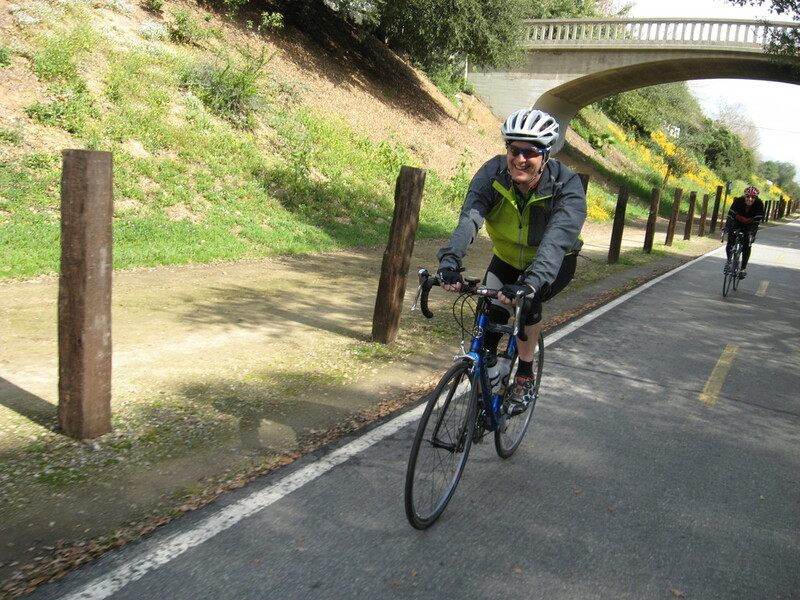 I thought it would be much more fun to get the bike club and ride out there from Pasadena to take the photo. So that’s what we did today. The ride out was pretty straightforward, and it was a bit of a slog, since we had a headwind all the way. 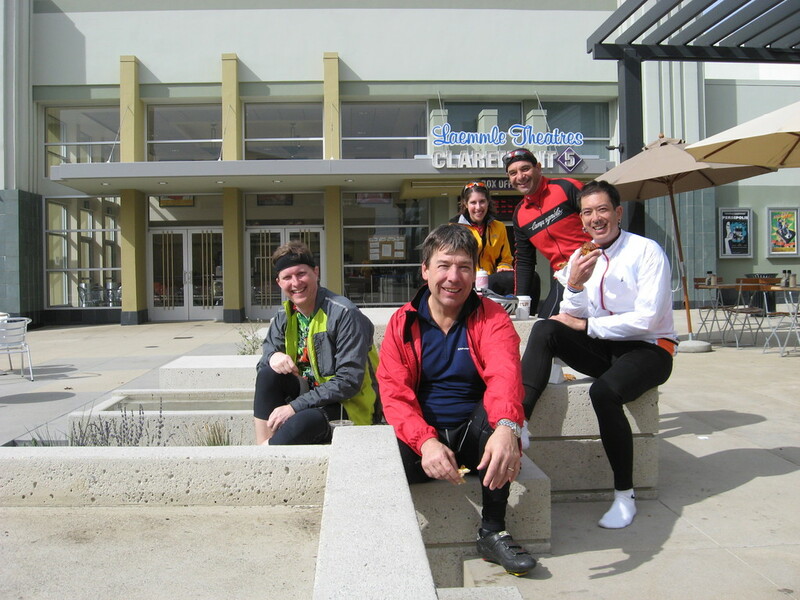 When we got to Claremont, we stopped for a snack at a little bakery by the Laemmle theater there. 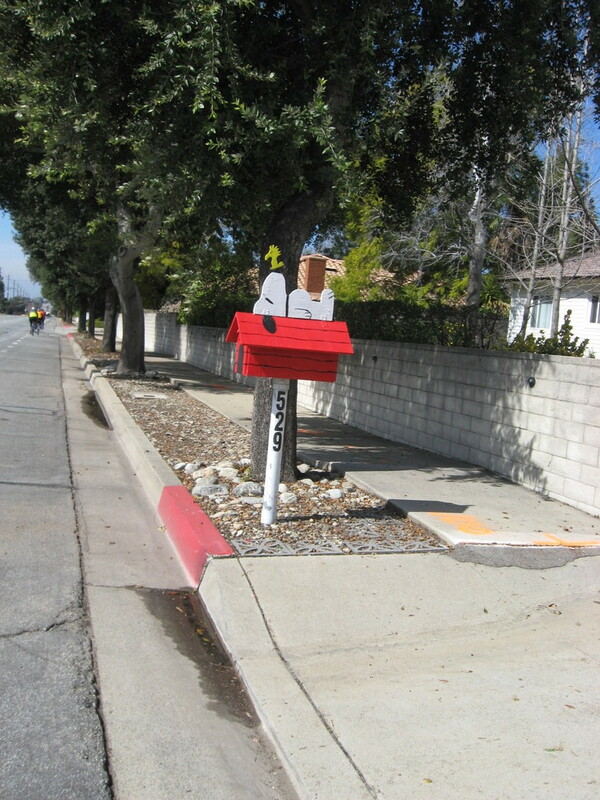 Then we took a winding tour across the campus of the Claremont Colleges, before heading up the hill on Mills Ave.
A short distance up the hill, we turned and rode over to Padua Ave, where I found the mailbox and photographed it. Then we turned around and started for home. The ride back was everything that the ride out wasn’t. There was a nice tailwind, and a good bit of it was downhill, so we really enjoyed it. Even when Doug got a flat in Glendora, we still remained in good spirits. So overall, it was a very fun little ride. Lucinda and I have become fans of “L.A. Ink”, so when they said that they were going to put on a tattoo and music show, we put it on our calendar. As it turned out, Lucinda decided that she didn’t want to go in the end. She was intimidated by the prospect of crowds and noise. But, since tattoo shows are one of my most favorite things, I went by myself. I went on Friday afternoon. Getting down to the O.C. in Friday traffic was a bit of an epic journey, but I got there all right. And parking was free, which was a nice treat. That sort of made up for the steep $28 ticket price. When I got inside, I saw that it was going to be a good show. There were notices on all the doors warning us that “each person in attendance irrevocably consents to being filmed or videotaped and releases the producers and users of such film or videotape from any liability…throughout the world in perpetuity.” Well, that about covers it, don’t you think? It was only 3:30, and there was a good crowd there already. And the camera crews gave it a circus-like quality that most tattoo shows don’t have. I wandered around and found some of my friends and talked for a bit. Then someone said that Kat Von D was at the High Voltage booth and greeting fans. I figured I had to get a picture with her to bring home for Lucinda, so I went and stood in the very long line for my turn. I don’t normally get star-struck, but Kat seemed very nice, and she was hot. But then again, I have a known weakness for pretty girls with lots of tattoos. Wandering around some more, I went into the music room to see one of the tattoo contests. The stage was good, but the lighting wasn’t. So it was hard to actually see the tattoos. then I wandered over the the vendors’ building. I walked in and saw that Burning Angel had a booth, and Joanna Angel herself was there. (Remember what I said about pretty girls with tattoos.) So I had to stop in and talk to her a bit. She was also very nice, and I got a good souvenir photo with her. Back in the tattoo building, Hannah’s new tattoo was finished. But before she got up off the table, the camera crew had to come down and film the crowd around her and also go in to the booth and film her. Then she got up and went to get some food. My final encounter with the stars of the show was when I got to meet Corey. He was standing in the aisle with a tray of french fries. So I got a picture with him to show Lucinda. The rest of my time there was spent just wandering around and schmoozing. It was a very fun afternoon and evening. Photos are in my tattoo conventions photo gallery. I am Dr. Herbert West, from “Reanimator.” I’m right. You’re wrong. Lucinda had so much fun playing in the snow last Monday that we had to do it again today. We went back to the same place, and she brought another friend along. They played hard for a long time, until it was starting to get dark and we had to go home. Today was an unusual Sunday for me. I wanted to go to the Center for Inquiry in Hollywood to hear Carol Tavris talk about her new book, Mistakes Were Made (but not by me). I’d bought the book on Thursday, and I’ve read about half of it so far. It’s quite good. So I cut my usual bike ride short in order to get home by 10:00 so I could make it over to Hollywood by 11:00. The talk was very good. Entertaining and informative. I got to talk with the speaker beforehand, and I told her about how after reading just the first few chapters of the book, I could see how we all do this. And in particular, how this normal human tendency can lead to the most bitter arguments. After the talk, she signed books. Then we all walked down the street for lunch at a local Thai restaurant.